Happy Friday! Today's card is one of the fold cards that is very popular right now. 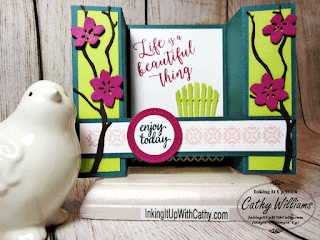 What is great about these cards is that they create a beautiful scene for sitting on your desk but fold flat to either side for mailing. Since there is not a good place for your handwritten message, you can add a piece of Whisper White to the back panel and write your message there. While it is difficult to see in this picture, there is a strip of the Tranquil Tide piece of washi and a Lemon Lime Ombre Ribbon across the bottom of the interior panel which the Adirondack chair sit on.